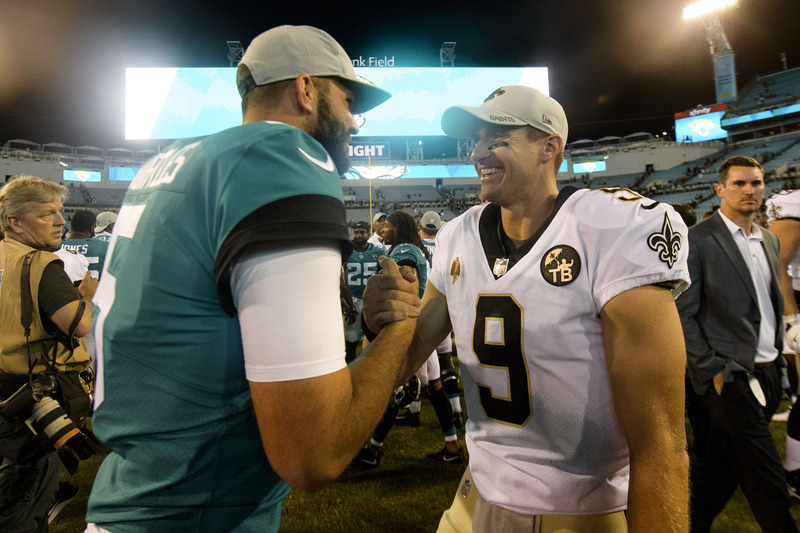 Bortles completed 6 of 9 passes for 53 yards and scored on a short bootleg in Jacksonville’s 24-20 loss to New Orleans in the exhibition opener for both teams Thursday night. A year later, his spot is as solid as just about anyone’s on the team. It showed against the Saints. “It’s a good way to start,” Jaguars coach Doug Marrone said. Yeldon said he “just didn’t want to come out” during the anthem. Ramsey was no longer in the locker room when reporters entered after the game. The Saints overcame a 10-point deficit in the fourth quarter to win. Jayrone Elliott’s strip-sack set up rookie Jonathan Williams’ 4-yard touchdown run with 2:16 remaining. Elliott had another strip-sack late in the game, but the Jaguars recovered. Saints backup cornerback P.J. Williams appeared to get the wind knocked out him while making a tackle. He jogged to the bench but later headed to the locker room. … The Jaguars had 10 guys who didn’t suit up, including All-Pro defensive end Calais Campbell (calf) and rookie defensive lineman Taven Bryan (abdomen).